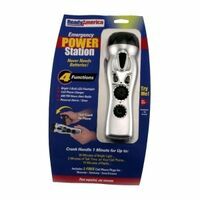 Ready America Emergency Power Station, Metallic, 4 Stations, Includes: (3) Free Cell Phone Plug AM/FM/WB NOAA weather radio with LED flashlight. Receives 7 weather band channels. Automatically activates when severe weather or other emergencies threaten your local area. Bright blue LED backlight changes to bright red during an alert with loud alarm tones and voice output at full volume. Standard AM/FM radio reception with telescoping antenna & 3.5mm earphone jack. Low battery indicator. Powered by 6.0 V AC Adapter (included) or 3 AAA alkaline batteries (not included). NOAA HAZARDS / AM / FM Weather Alert radio, monitors all 7 weather band channels. Clear AM / FM digital radio. Press one button to standby for alerts: ALL HAZARDS or TORNADO ONLY ALERTS. Bright LED flashlight for power outages. Dual Color LCD with scrolling alert text. 3 alert LEDs. 6" protected telescopic antenna. Non-slip grip sides. Battery power, AC/DC jack, earphone jack (3.5 mm), strap attachment (top/bottom) and LED flashlight button.